IPOWER 12W 24W LED Grow Light Bulb E26 with Clamp Lamp Plant Seed Flower Veg. Engineered for optimal PAR value and large coverage, iPower 300w LED grow light is designed to prevent a concentration of intense light in the middle of the growing area which may result in stunted growth or leaf scorch. Constructed with 18 ultra bright LEDs (12 white & 6 red). Rapidly boost the growth of plants, generate more leaves popping up within 2 weeks on a daily basis. Perfect for indoor and greenhouse plants, garden, herbs, vegetables, seedlings, hydroponics & Aquaponics grow systems, etc. Low Power Consumption & High Luminous Efficiency & Long Service Life!! The electronics inside are stepping down the voltage. High power efficiency produces more lumen/watt and less heat. White LEDs provide a balanced broad-spectrum of cool & warm mixed color; includes blue and red spectrums needed for growth and flowering. Designed to fit standard E26 socket, easy to set up and use - no special lamp needed, a desk lamp will do. Specially designed for high humidity grow environments to maintain optimal performance. These Led grow lights are used to grow orchids, roses, peppers, tomatoes, basil, lettuce, herbs, kale, spinach, wheatgrass, broccoli, wildflowers, cucumbers, and many other fruits and vegetables. 2399 Bateman Ave, Duarte, CA 91010. GLLEDX iPower Waterproof LED Grow Light Bulb 12/24W, 6 Red 12 White LEDs with Clamp Lamp Our LED grow lights are great for growing or perking up vegetables and flowers and any houseplants. Make excellent choices for cloning and seedling lights since they can be placed in tight spaces without worrying about heat build up. Also suitable for all stages of plant growth Choose From Four Different Options ---12 Watt LED Grow Light Bulb ---24 Watt LED Grow Light Bulb ---12 Watt LED Grow Light Bulb with Clamp Lamp ---24 Watt LED Grow Light Bulb with Clamp Lamp DETAILS & SPECIFICATIONS Features ---Constructed with 18 ultra bright LEDs (12 white & 6 red). Perfect for indoor and greenhouse plants, garden, herbs, vegetables, seedlings, hydroponics & Aquaponics grow systems, etc ---Low Power Consumption & High Luminous Efficiency & Long Service Life!! IPower Multi-Spectrum LED Grow Light Bulb for Plant Growth. 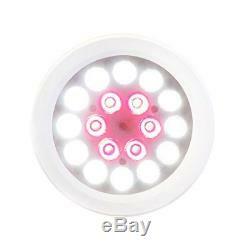 IPower Waterproof LED Grow Light Bulb 12/24W, 6 Red 12 White LEDs with Clamp Lamp. 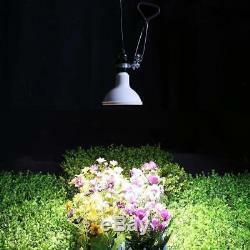 Our LED grow lights are great for growing or perking up vegetables and flowers and any houseplants. Also suitable for all stages of plant growth. Choose From Four Different Options. 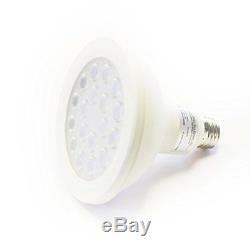 12 Watt LED Grow Light Bulb. 24 Watt LED Grow Light Bulb. 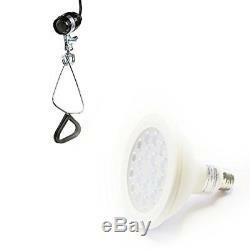 12 Watt LED Grow Light Bulb with Clamp Lamp. 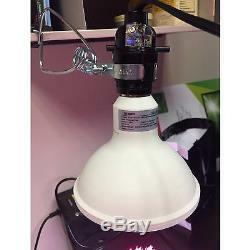 24 Watt LED Grow Light Bulb with Clamp Lamp. Widely used in greenhouse, plant factory, greenhouse farming, flower farming, indoor garden, water soluble breeding, pipeline cultivation, farm, potted plants, spray the plant, tissue culture and so on. 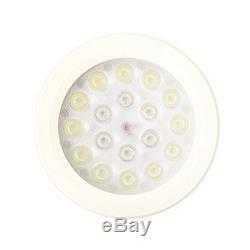 12/24 Watt LED Grow Light Bulb - 18 LED's? 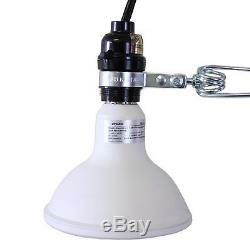 Clamp Lamp - Rated for up to a 150-Watt Bulb - 6 FT cord - non-marring clamp grips for a secure hold - UL Listed. SECURE & HASSLE FREE SHOPPING. We are located at 2399 Bateman Ave, Irwindale, CA 91010. The item "IPOWER 12W 24W LED Grow Light Bulb E26 with Clamp Lamp Plant Seed Flower Veg" is in sale since Wednesday, December 28, 2016. This item is in the category "Home & Garden\Yard, Garden & Outdoor Living\Gardening Supplies\Hydroponics & Seed Starting\Grow Light Bulbs". The seller is "hpsgrowlightstore" and is located in Duarte, California. This item can be shipped to United States, Canada, United Kingdom, Denmark, Romania, Slovakia, Bulgaria, Czech republic, Finland, Hungary, Latvia, Lithuania, Malta, Estonia, Australia, Greece, Portugal, Cyprus, Slovenia, Japan, China, Sweden, South Korea, Indonesia, Taiwan, South africa, Thailand, Belgium, France, Hong Kong, Ireland, Netherlands, Poland, Spain, Italy, Germany, Austria, Israel, Mexico, New Zealand, Philippines, Singapore, Switzerland, Norway, Saudi arabia, Ukraine, United arab emirates, Qatar, Kuwait, Bahrain, Croatia, Malaysia, Brazil, Chile, Colombia, Costa rica, Dominican republic, Panama, Trinidad and tobago, Guatemala, Honduras, Jamaica.